As you may have noticed late last week I posted a review on our new gerbil cage and I’m happy to report that things are going well. The gerbils are still thriving and are now getting used to being handled and cuddled. They are still quite young so have been a little nervous, one more than the other, and have found the girls’ voices startling at times (I empathise with them there)! They are very active too, often at night which as surprised me so I think for now they’ll need to stay downstairs. Although our intention was that they could move up to Miss E’s room once they had settled in, the noise they made last night at 3am won’t go down well in a 9 year old’s bedroom. Gnawing on things like these Feedem animal feedsticks is one thing but chewing on a noisy plastic wheel is another. So this whole new experience has me thinking about how pets, or even our little gerbils could affect the value of our homes and if so, should that matter. Apparently pets can devalue your home so you need to ensure you look after them and your home a little more if you have them. No potential buyer wants to enter your home to the heady aroma of cat urine or stale gerbil bedding. You don’t need to leave urine stains on the carpet or pet beds out in the open when you’re trying to sell your house. A few years ago now before children, we owned two cats and had to sell a ground floor flat where they lived. We took advice from the estate agent and ensured they were out for the day, and then went about removing any evidence of them. It was particularly important, we were told, to remove their food bowls and any old food, as well as their beds. It’s highly likely that as pet owners we get used to the smells that these objects bring, and we love our pets so we don’t worry about them too much either. But many potential buyers won’t be a pet owner or even an animal lover so you could be doing yourself a disservice by leaving this kind of ‘evidence’ in the home when you’re trying to sell it. This article from Time magazine even goes so far as to suggest we can add a ‘negative resale value’ on to the cost of owning a pet, which can already amount to thousands for a dog. So should we be worried? Well I think not to be honest. As long as we look after our homes whilst the pets live there too, keeping the floors and upholstery as clean as possible, and ensure we can remove traces and smells from the home when we come to sell. And it won’t put everyone off. Even ferrets kept in landing cupboards, and cats throughout the house won’t put an enthusiastic buyer from buying a house if it’s what they really want. 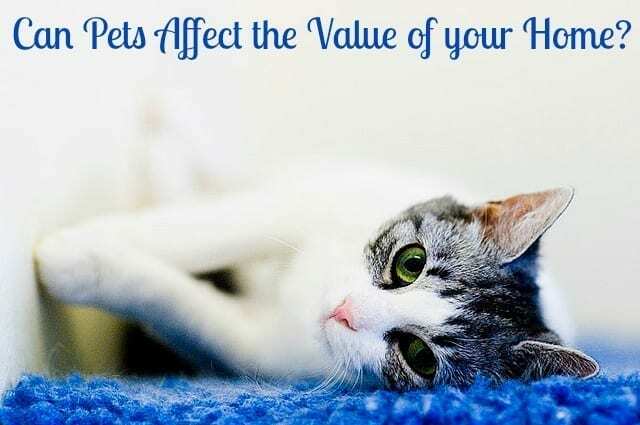 It’s just worth bearing in mind that it may devalue your property if you don’t look after it and do what you can to minimise the damage pets can cause. I’m going to take a piece of my own advice and ensure the girls keep the gerbils cage spotless and clean to avoid any unpleasant smells in the house. That way it can’t build up or put anyone off. Pets are a wonderful way to engage children, to encourage their nurturing side and show them the cycle of life as well as responsiblity for others. This has it’s own value, that outweighs anything else I think. And for now we’re happy hunting for toys and treats at Feedem.co.uk in the hope they stay well and healthy for a few more years to come. For me my pets are the ones which keep me going, whenever I am down with something or some problems creeps in, its my pets who bring to me the solace. Thanks for the share.